The reason for this is to try to maintain balance. The same way that eating a balanced diet should help keep you healthy, maintaining personal balance is important. I started thinking about what it takes to get that balance and how many arms a scale would need in order to depict an in-synch life. There’s simply too many factors and they’re so variable from person to person that what I say may be meaningless to you or be 100% on target. A more universal concept is probably a traditional two-armed scale. On one arm there’s you and what you need to be happy. On the other arm are others whom you’d find life hollow without. 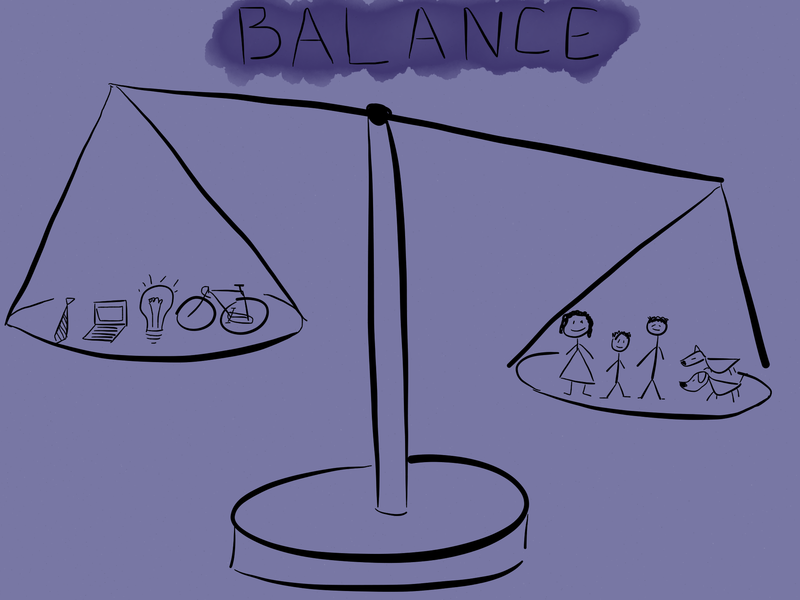 Balance between You and Others can be tough. Always grow and share to live. Things can fill up either side. Everyone likes spoiling themselves a little. It could be a dinner out, a new phone, some clothes, or a gadget. Things are usually fleeting though. In the end, we really have our health and those around us. Here are a few of the things I’m going to put on the scale which help me keep myself balanced. Family. They’re the ones who we’re responsible for and who are responsible for us. There’s nothing more important. Friends. Having relationships outside of work duties and family is important. Friends give you perspective from different directions and help you pursue interests. The best ones are really extensions of your family and are there for each other when there’s need. Thinking and growth. I don’t think I know anyone who dreamt of a job in elementary school and pursued it all the way through retirement. Everyone grows and builds interests. Spending time investigating these is critical for making the journey of life. There’s the need to spot trends and opportunity for work as well as taking in the world as it evolves around us. Career. Hopefully you work with the goal of providing for the rest of your life rather than work being your life. Better yet, hopefully what you do provides you with challenge and enjoyment. I really like what I do and aligning my job with my interests. That can make it more difficult to draw lines between personal time and work time but the need to do so is still there. Being active. Getting up and active is great for so many reasons. Having physical conditioning increases self respect and gives you the ability to enjoy so much of life which you’d miss being couch-bound. It’s good for mental health as well. Hobbies and interests. Hobbies can help split that work/personal time plus draw in friends and family. I know people who are history buffs, photographers, car modders, cyclists, cooks, audiophiles, and more. Being a part of a community where you can share interests really does expand your learning and give a sense of satisfaction. There’s also a “none of the above” area for me. Down time also helps me keep balance. There are times when I feel like I’ve done enough of everything on the scale. Enough can be enough. A little meditative time, web surfing, TV watching, or just chilling out makes the world slow down for me. Many of these areas are interwoven. Much of what I put on the “You” side is done with family and friends. Just being aware that there are different places to shift your time makes it easier to do so and realize when you’re putting too much in any one area or neglecting another. As they said on GI Joe, knowing is half the battle. You know the whole crew! Most of that will be at Thanksgiving. No tie though. I like these thought, Nephew! Thanks! It can be tough at times.